The Ki-49-I Donryu is a Rank II Japanese medium bomber with a battle rating of 3.3 (AB), 3.0 (RB), and 3.7 (SB). It has been in the game since the start of the Open Beta Test prior to Update 1.29. 68 mm Bulletproof glass in front of pilot. 12.5 mm Steel plate in front of pilot. 16.5 mm Steel plate behind the pilots. 12.5 mm Steel plate behind the dorsal gunner. 12.5 mm Steel plates surrounding the dorsal gunner. 12.5 mm Steel plates in front of the tail gunner. If attacked by fighters, it is important to remember and recognize the Ki-49's turning capabilities. It is actually possible to win lateral turn fights against fighters with this aircraft. Try not to act like a "sitting duck" because the Ki-49 features little armor protection and has limited defensive capabilities as far as weapons go. With only 7.7 mm machine guns, this aircraft is not suited for air to air combat against fighters. The best belt to use is the armored targets belt. If you can't shake someone off your tail aim for the pilot or the engine - your only hope of destroying the enemy plane. Pulling hard maneuvers will throw the enemy off and allow you to set up for more defensive fire. This aircraft has the ability to hold up to 1,000 kg of bombs in several different variations. 12 x 50 kg bombs, 2 versions of 4 x 250 kg bombs, 1 x 500 kg bomb, and 2 versions of 1 x 800 kg bomb. Use the 12 x 50 kg bombs to attack light tanks and light pillboxes. They are not viable against bigger targets, since direct hits are needed to destroy. This load out is particularly useful on maps like Zhengzhou where there is an abundance on non-moving targets (light pillboxes). Use either of the 4 x 250 kg bomb versions to destroy heavier targets such as medium tanks, pillboxes, destroyers, and cargo ships. Although different in real life, both kinds of 250 kg and 800 kg bomb seem to do the exact same thing. It is purely up to choice which variation to use. It is not recommended to use the 500 kg bomb simply because one can opt for the 800 kg bomb with only a slight performance decrease. In any case, use either of these bombs to destroy targets like carriers or mini-bases. In arcade battles, this aircraft is particularly proficient at bombing bases, especially with a maxed reload crew skill. Since the Ki-49 can virtually turn on a dime, instead of having to line up longer bombing runs like heavy bombers this aircraft can "hover" over the base or airfield and attempt dive attacks. The 800 kg bomb is particularly useful here because you only have to drop one bomb instead of spamming multiple. It's also possible to use this same tactic against pillboxes or tanks. With fighter cover, a good reload time skill and good aim it's possible to destroy dozens of ground units. The Ki-49 first saw service in China. After the outbreak of the Pacific War it flew in New Guinea Australia. The Ki-49 was also used in the defense of the Philippines. The first unit to receive Ki-49 Donryu was the 61st Sentai in China. Unknown amount of Ki-49s were involved in the Battle of Okinawa in 1945. Twin-engine monoplane medium bomber with retractable landing gear and tail wheel. The development of a new medium bomber (heavy bomber, by Japanese standards) for the Japanese Army Air Force began in the spring of 1938. 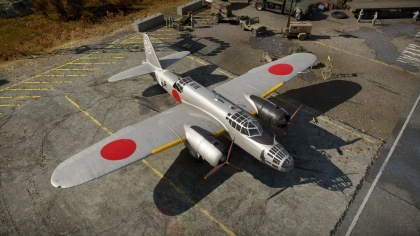 The new airplane was to replace the Mitsubishi Ki-21 bomber. 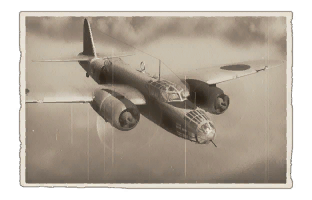 Based on Japan's experience in its war with China, special attention was given to providing the bomber with high speed capabilities and strong defensive weaponry so that it could operate without fighter cover. The crew needed protective armor, and self-sealing fuel tanks were essential. The first prototype of the Ki-49 (#4901) made its first flight in August of 1939. Production of the aircraft began in August 1940, and the plane was designated as the Nakajima Ki-49-i Donryu (""Storm Dragon""), type 100 model 1. The Ki-49-I was equipped with two air-cooled 14-cylinder radial Hakadzima Ha-41 engines rated at 1250 hp each. The plane's defensive armament included 1 Ho-1 Type 97 20mm cannon in the upper fuselage and five 7.7mm Type 89 machine guns (which were significantly modernized versions of the Vickers), located in the nose, sides, and underneath the aircraft. In addition, one gun was located in a tail turret, the first time such a turret was employed by an aircraft of the Japanese army. The bomb bay, which occupied almost the entirety of the aircraft's middle section, could carry bombs ranging from 100 to 250 kilograms, in various combinations. A normal load was 750 kilograms, an overweight load, up to 1000. The new planes began to be delivered to the front in August of 1941 and were widely used over New Britain and New Guinea as well as in raids on the Australian port of Darwin. It soon became evident that the Ha-41 engine's power was insufficient, and the controllability of the aircraft suffered as a result. The bomber's speed was not high enough to outrun the newer fighter planes. However, pilots approved of the plane's armor, the power of its defensive weaponry, and the reduction of that weaponry's ""blind spots."" In all, 128 Ki-49-I aircraft were constructed. This page was last edited on 10 March 2019, at 19:04.